Information Articles - Branding Techniques - Ownership Identification Inc. 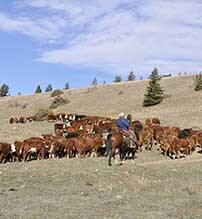 Prior to impressing a brand on livestock it is necessary that you obtain a registered brand from OII. Once you have received your brand registration certificate, you can have irons made and brand livestock that you own. Your brand certificate will indicate the brand and position on the animal that has been allotted to you. It is critical that you brand in the exact location since someone else in BC may have the same brand but in a different location than you. It is critical that the animal be restrained as much as possible. This may be accomplished by manually wrestling to the ground, the use of a calf table or a cattle squeeze for larger animals. The animals must be dry. If the hide is wet, it robs the iron of heat and causes scalding resulting in a blotched brand. Clipping the area to be branded improves the quality of the brand. It also speeds up the branding process. This would also reveal if there currently is a brand in the same location that your brand is. If this is the case brand above, below, behind or in front of the previous brand. It is an offence under the Livestock Identification Act to alter, obliterate or deface a brand already on the animal. Do not apply your brand in another position as it is possible it may be registered to someone else in that position. It is critical that the iron be at the correct temperature for the impression to be successful. Electric irons maintain a fairly constant temperature so generally there is little to worry about. However with steel irons, if the irons are too cold the brand will be unsuccessful while if the irons are too hot, the hide will be burnt more than required. The degree of heat can be determined by the colour of the iron. A black iron will be too cold and will burn the hair but not the hide. A red-hot iron is too hot resulting in burnt hair, an excessive burn to the hide and generally a blotched brand. The correct colour for the iron would be a wood-ash gray. This would burn the hide sufficiently to deform the roots of the hair follicles. This is necessary for the new hair to grow at a different angle than the original hair so the brand is visible. Irons can be heated by wood or propane. Using wood, start with a large fire and let it burn down to a bed of red-hot coals. The irons should be kept on top of the coals and not in the flame of the fire. Using propane, it is recommended that a steel drum or large pipe be used to contain the heat supplied by a tiger torch. With both methods, be sure the irons are a wood ash colour before applying them to the animal. The hot iron should be applied to the animal firmly and then rock the handle slightly to assure that the brand characters are applied evenly. This prevents under burning or over burning. When the iron is removed in three to five seconds, the hide should be a buckskin colour and look like saddle leather. If the iron is removed too early, a temporary brand (hair brand) will be left that will soon disappear. In this situation, take extreme care to apply the iron a second time in the exact same location to avoid any blotching. This is a technique where a super cold branding iron is applied to the hide which kills the pigment producing cells resulting in the growth of white hair instead of coloured hair. 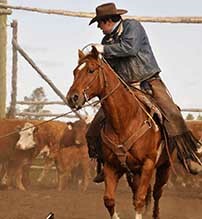 It works successfully on both cattle and horses. The resulting brand will be readable at any time of the year and, if applied properly, will seldom blotch. The disadvantage is that extra care must be taken in the application of the brand, it is necessary to clip the site closely and a source of refrigerant must be available. The process takes longer than hot iron branding and the irons should be made of copper or stainless steel. The irons should be thicker and deeper in order to keep the face of the iron cold. The face should be ½" (12.5 mm) thick with the corners well rounded. The irons must be cooled in a container of dry ice and 99% alcohol or in liquid nitrogen (best). Liquid nitrogen is available from artificial insemination units and welding supply firms. The animal must be restrained - a squeeze for cattle and a twitch for horses. The site where the brand will be applied must be clipped and then washed with alcohol to remove any dust or dirt. Immediately prior to applying the iron, saturate the branding site with alcohol at room temperature. Apply the iron to the site with firm pressure and for the proper time as indicated below. On white haired animals, the time should be increased by at least 10 seconds to completely destroy the hair growth. This method of branding is illegal in British Columbia.